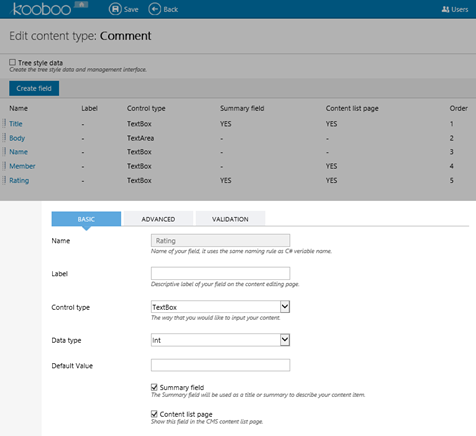 Jquery is installed by default on Kooboo so we don’t need the jquery support files. 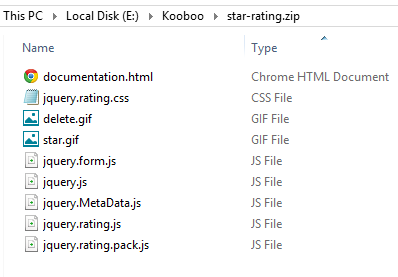 You will need to copy the plug-in jquery.rating.js (or jquery.rating.pack.js), the two images delete.gif and star.gif, and the jquery.rating.css file into your Kooboo site. 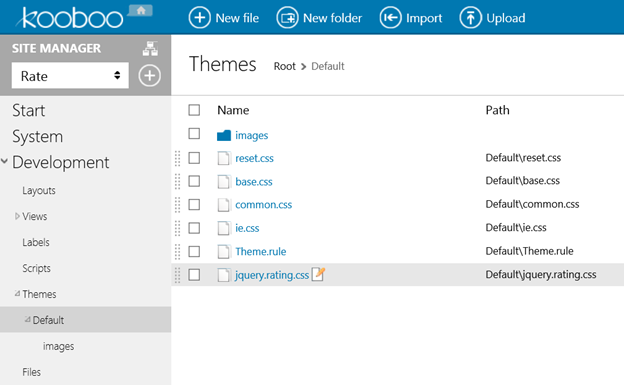 Open Development -> Theme / Files and Upload the jquery.rating.css file. 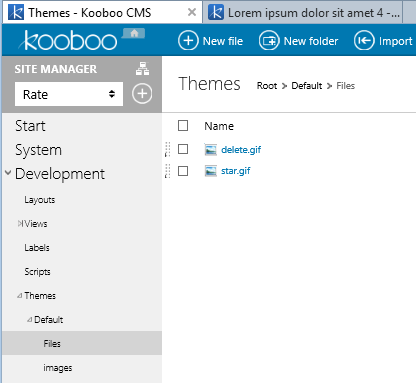 Now create a ‘Files’ directory and copy the two .gif files into that directory. 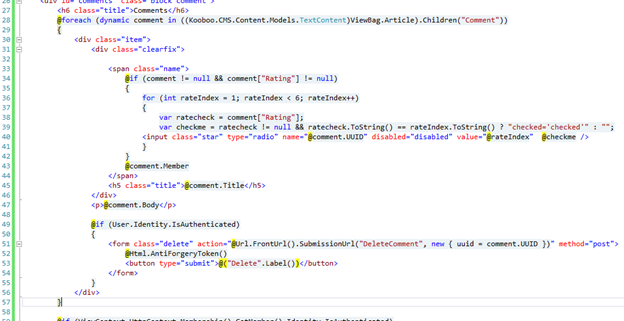 NOTE: In order to determine where the files resided I had to look inside the .css file where I could see the image files were expected to be in a sub-directory named Files. The css file directory is the reference directory used when resolving a relative link so Files/<image>.gif requires the two images be installed in that subdirectory. That is it, you have installed the plug-in. Settings for the plug-in are demonstrated at the plug-in website if you are interested in finding out more. In a prior post I explored adding an element to the Articles Comments. Seeing a single Star Rating control blown out for accepting input helps understand the Star plug-in. Below I demonstrate how value and title are used to setup a 5 star input control. 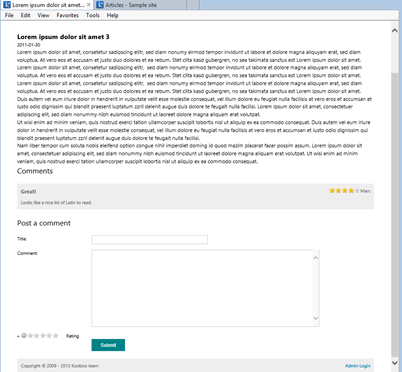 We need to provide a place to store the rating so access the Comment ContentType and add the field for Rating. 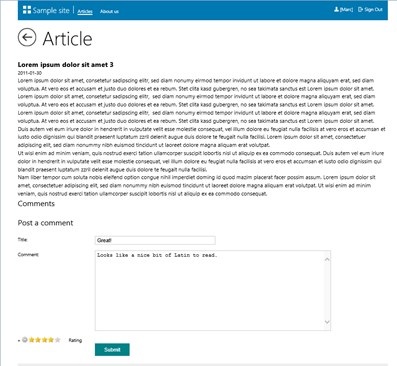 Navigate to the Articles Page, select an Article, add a comment with a rating, and see that it appears in the Detail.